Help Watch Captain Astanya shore up security for the Queen's visit. Vulkhel Guard — Support the City Watch in Vulkhel Guard. I've arrived in the city of Vulkhel Guard, gateway to Auridon. Security is tight as Queen Ayrenn, the new leader of the Aldmeri Dominion, prepares for a public appearance. Talk to Watch Captain Astanya. 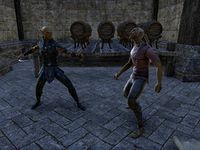 Help both Advisor Norion and Steward Eminwe patch holes in Vulkhel Guard's security. Return to Astanya, then find Watchman Heldil. Enter the suspect's house and witness the confrontation. Once you arrive in Vulkhel Guard, head to Watch Captain Astanya. If you have already stopped the Maormer attack on Khenarthi's Roost, tell her about it and she will promise to inform those who need to know. Regardless, she will then ask for your name as part of security precaution. When you ask if she needs help, she tells you to assist Advisor Norion and Steward Eminwe, as the guard has its hands full right now. You can help them in any order. Eminwe is in a warehouse, busily checking over all of the food in storage, and tells you that two of the chefs preparing food for the queen's feast fell ill after working with some of the ingredients. Check over the side warehouses for any infected food. Eventually, you will come across a container with poisoned meat in it. As you leave the warehouse, you may be attacked by a Heritance Soldier, who will command you to "Hold it right there!" After defeating the enemy, show the poisoned meat to Eminwe, who is relieved, but still believes it was simply a test. If you mention your attacker, she will simply claim it must've been a common cutpurse looking to steal cargo. She will tell you to save the meat to show to Astanya, and will direct you on to Advisor Norion at the west end of the docks. Upon locating Norion standing outside a large warehouse, he will tell you that a burglar sneaked into the warehouse to steal marine deployment plans for the speech that the queen is planning to make in the near future. Enter alone to witness an assassin murdering the burglar and then disappearing. Collect the plans, which are lying on the ground near the corpse, and show them to Norion, telling him about what you saw. He is unconcerned about it all and directs you towards Astanya, excusing himself to find the queen. Once you have sufficient evidence of a violent plot, bring it to the watch captain. 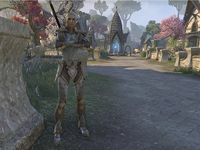 She will cut you short, directing you towards a new development: A wanted Altmer with valuable information has walled himself inside a house, threatening to kill himself should anyone approach. Since you're not actually part of the guard, you should attempt to negotiate with him, allowing the guard to sneak in behind you. Convince Fasion to let you in. He is aware from the start that the guard plans to use you as a distraction, but uses the little time he has to tell you that Captain Astanya is the danger to the queen, not him. He says she's part of a group called the Veiled Heritance, and bribed guards to help with her plot to assassinate the queen. He begs you to inform Queen Ayrenn of this danger to her life. At this point, Watchman Heldil and Watchwoman Faritaale will enter the building. Faritaale incapacitates Fasion, and Heldil congratulates you for your work, assuring you that Fasion will receive a fair trial. Now, you can finally take your evidence to Astanya without distractions. I should speak to Watch Captain Astanya at the docks. I should speak to Advisor Norion in the west warehouse. I should look for the plans inside the warehouse. I found the plans Advisor Norion spoke of. I should report back to him outside of the warehouse. I need to seek out Steward Eminwe at a warehouse on the north end of the docks. I should examine the nearby storage sheds for evidence of sabotage. I've discovered some suspicious salted meats, possibly poisoned. I should return to Steward Eminwe back at the warehouse. I should now report back to Watch Captain Astanya. She asked me to report back to her at the town's upper level. Watch Captain Astanya has, somewhat rudely, directed me to speak with Watchman Heldil. The guardsman wants me to speak with the criminal he has cornered in the house. I should head inside and speak to this criminal. Watchman Heldil has moved in behind me to arrest Fasion. Looks like my work is done here. I should speak to the watchman one more time. Finishes quest I should speak to Watchman Heldil. This page was last modified on 7 April 2019, at 07:03.